This module will give you an introduction to the subject of the gas laws. The two main gas laws are Charles gas law and Boyles law. Attempt the question and then view the module. A cylinder charged to 250 Bar has a volume of 30000 mm3 at 25C. It is involved in a fire and reaches a temperature of 350C, its volume increases to 31,500 mm3. What would be the pressure inside the cylinder? A CO2 fire extinguisher charged to 56 Bar has a volume of 1m3 at 25C. It is involved in a fire and reaches a temperature of 550C, its volume increases to 1.001m3. What would be the pressure inside the cylinder? A vessel at -55C contains gas at a pressure of 15 Bar. We can assume that the volume of the vessel will remain constant. If the bursting pressure = 60 Bar, at what temperature will the vessel fail? 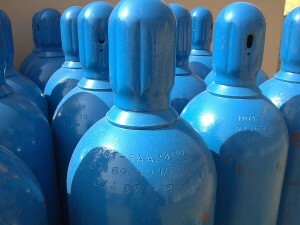 An acetylene cylinder at a pressure of 10 bar is stored in a container which is involved in a fire and is heated to 500C. The vessel is protected by a fusible plug which operates at 30 bar. Would the fusible plug have operated in the fire. You can assume that the volume of the cylinder remains constant. A nitrogen cylinder has a volume of 0.1m3. It contains 7m3 of nitrogen when released at normal temperature and pressure 1 bar 15C. 1. What is the pressure of the nitrogen in the cylinder at 15C.? 2. If the cylinder is heated in a fire to a temperature of 300C. What will be the pressure of the gas? 3. If the gas is suddenly released, what volume will it occupy? This module will cover the issue of the ideal gas law. Attempt the following question and then view the module. A flask contains 0.09kg of Nitrogen. The flask has a volume of 0.02m3 and is at a temperature of 20C. a)State the number of moles of Nitrogen in the flask? b) State the number of molecules of Nitrogen in the flask? c) What is the pressure inside the flask?